Ready for the Open Road!! This is me on my 2002 Suzuki 800 Marauder! This is my first season riding although I received my license in 2008. The handsome guy beside me is my husband of 18 years, best friend and now biker buddy, Troy. He surprised me with the bike a couple of months after I got my license. 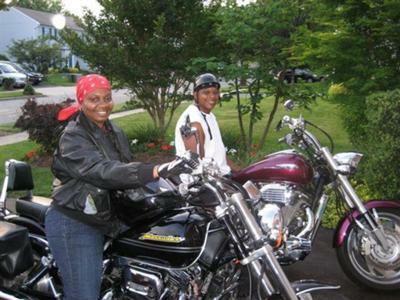 In this pic I rode my Marauder to his mother's house and his sister took a picture of us. That was my first ride outside my neighborhood, which is about 5 miles away. So, I did a cool 10 miles my first ride!! When I made it back home, my husband gave me a big hug...it brought tears to his eyes! (Awwwww!) We have been talking about riding together since he started riding 5 years ago. And now we are! He tells everyone! The funniest thing, is that my husband is used to getting all the attention on his "pretty" bike. Well now, the attention is all on ME! I was on the highway and noticed in the mini van next to me that a young boy was was video taping me as I was riding...the license plates were from Tennessee. That was cool. Men and women love to see a female on a bike and handling it! He gets jealous, but at the same time he's proud to say, "That's my wife!" So far, I rode my bike to/from work and rode out to Chesapeake Beach in Maryland twice. Before the summer is over we plan to go on two rides in Maryland. First, to Solomon's Island with some friends, and then to Ocean City, MD. Both rides are a little over 2 hours. I can't wait! Although, I am a rookie rider, I am enjoying that sense of freedom that I have read and heard from many veteran bikers! To my fellow Women Riders, RIDE ON!!! Comments for Me and My Marauder! We are supposed to be going to OC in August. I am excited...I said the same thing about the time/distance, but I am SO going to do it! I try to get as much time on my bike as possible. We have a lot in common! I'm from Maryland also and just started riding this year. My husband has ridden forever and now we are biker buddies also. I know exactly what you mean about people noticing a women rider! I get a lot of second looks..haha. I am trying to put as many miles on my bike as possible, so I also ride to work or any chance I get. I even rode it to choir practice the other day. The little old ladies in the choir didn't know what to say! We are going to Ocean city next week and I think I'm going to ride there. It's a 3 hour ride, but I think if I make a few "pit stops" I'll be fine. The Bay Bridge scares me a little, but I know I can do it. Good luck to you and happy riding!